Framed Wall Mounted Letter Board Frame Color: Aluminium, Size: 18'' H x 24'' W by Aarco at Ledina. MPN: BOFD1824. Hurry! Limited time offer. Offer valid only while supplies last. BOFD1824 Frame Color: Aluminium, Size: 18'' H x 24'' W Features: -1 Free set of 0.75'' Helvetica letters and assortment tray included. -Letter board. BOFD1824 Frame Color: Aluminium, Size: 18" H x 24" W Features: -1 Free set of 0.75'' Helvetica letters and assortment tray included. -Letter board. -Factory Attached Mounting Hangers. -Made in USA. -Available In Size: Small Sizes; 2'X1.5'; 3'X2'; 3'X3'; 3'X4'; 3'X5'; 4'X5'; 4'X6'; 4'X8'. -Frame: Wood; Aluminum. 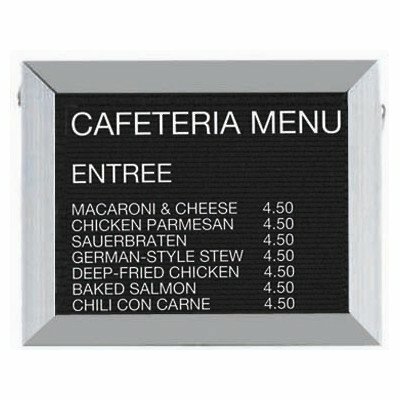 Product Type: -Letter Board. Mount Type: -Wall Mounted. Application: -Home. Color: -Black. Country of Manufacture: -United States. Surface Material: -Felt. Frame Type: -Framed. Frame Material: -Metal. Size 12" H x 18" W - Size: -Mini - Up to 2'. Size 36" H x 30" W - Size: -Small 2' - 4'. Size 48" H x 72" W - Size: -Medium 4' - 6'. Size 48" H x 96" W - Size: -Large 6' to 8'. Dimensions: Overall Height - Top to Bottom: -8". Size 12" H x 18" W - Overall Length - Side to Side: -18". Size 18" H x 12" W - Overall Length - Side to Side: -12". Size 18" H x 24" W - Overall Length - Side to Side: -24". Size 24" H x 36" W - Overall Product Weight: -4 lbs. Size 36" H x 30" W - Overall Length - Side to Side: -30". View More In Changeable Letter Boards. If you have any questions about this product by Aarco, contact us by completing and submitting the form below. If you are looking for a specif part number, please include it with your message.